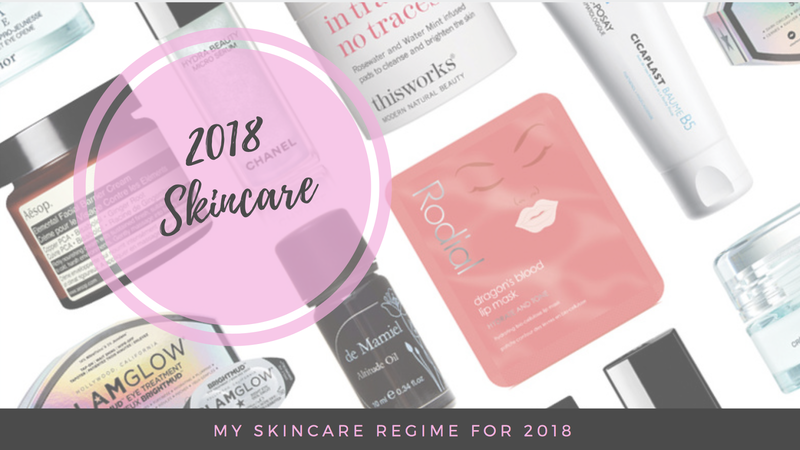 This year I've decided that I want to put a huge focus on my skincare regime and taking care of my skin. Last year I didn't quite have a routine of any sort, I just sort of slapped on whatever moisturiser or mask I had closest to my reach. I don't have trouble skin so while it didn't really affect me by not having a routine, it made me wonder how good the results could be if I did put a focus on my skin. As such, my skincare regime for 2018 was born and it's quite intensive but has already shown amazing results. My recent holiday in Vietnam was a blessing and a curse for my skin. The dirt and pollution blown in my face from riding around on a scooter did see me breaking out bit but I also had some time on my hands so started to play around more with masks and ensuring my skin was hydrated. So primarily my skincare this year is filled with Skinstitut products. To remove my makeup I'm using the Garnier Micelleir water. I ws using Dermalogica Pre-Cleanse last year but I feel as though it was breaking me out each time I used it. I then wash my face twice using the Skinstitut Gentle Cleanser with a Clarisonic. Once I'm out of the shower I sprite on some Skinstitut Gentle Mist. I follow this up with either the Skinstitut Vitamin C Serum or a Hylamide hydraluron gel. Then it's time to moisturise and a toss up between the Repair Balm or Dry Defence moisturiser. If I feel like I really need the moisturise, I will follow it up with the Multi Active Oil by Skinstitut. I want to be putting a minimum of 2 face masks on a week - one of which definitely being a hydrating mask. The other might be exfoliating, purifying or vitamin based. I really like the Dermalogica Multivitamin Mask or any of the L'Oreal Clay Masks. Skinstitut also do a great hydrating mask. I will also aim to do a pore strip each week because I feel like they work for me most of the time. So that's the routine! I don't know if it sounds excessive or just about right but so far it's giving me great results. I went through a purging state with my skin where it was constantly breaking out after all the changing, particularly using the Clarisonic (they say this is expected). However, it's calmed down now and feels a lot more plump, hydrated and healthier in general. Any recommendations? I would seriously love to hear! Drop me a line at @JordyCannon on Instagram, Twitter or Facebook. Otherwise simply leave me a comment on this post.